Landscape with Hunt of Atalanta and Meleager was painted by Rubens in 1635. In this monumental landscape with small figures, Rubens depicts the hunt for the Calydonian boar as related in Ovid's Metamorphoses. King Oeneus of Calydon forgot to make sacrifices to Diana, upon which the angry goddess sent a raging boar to plague his country. A large-scale hunt was organized, and Atlanta succeeded in drawing first blood, while Meleager delivered the death-blow. 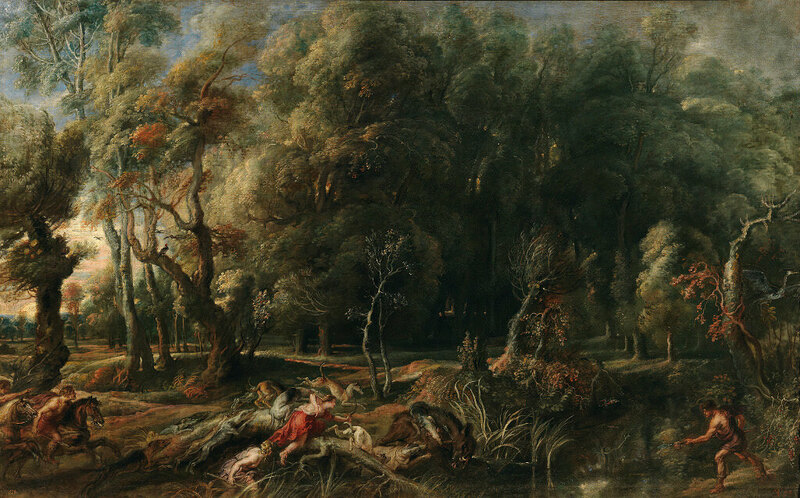 Rubens has painted the hunting party against the background of and imposing forest, as indicated in Ovid's description. The boar, wounded by an arrow behind his ear, has been cornered by the hounds near a pool. Meleager rushes in from the right with a spear, while two riders (the Dioscuri, Castor and Pollux) enter from the left. Rubens developed his competence in landscape painting during his later years, when he lived on his country estate near Elewijt, Het Steen. The work in the Prado is one of the few landscapes he painted on canvas. Usually, the painter preferred panel, which allowed him to work more precisely, to experiment and to enlarge the composition at will by adding new planks, as is evident from a considerable number of surviving landscapes by his hand. Copyright © 2011-Present www.PeterPaulRubens.net. All Rights Reserved.